Jelly Bean Row in the downtown core of St John's, Newfoundland, is a unique place to visit where each of the houses are painted in a variety of colors giving off the appearance of jelly bean colors. Below each window, in the white painted planters which match the paint on the exterior of the window frame, the potted plants are blossoming displaying their beautiful colors. Each planter has a different arrangement of potted plants which makes every window appear distinct when the flowers are blossoming. There are five windows on each of the houses, the sixth opening being the entranceway. 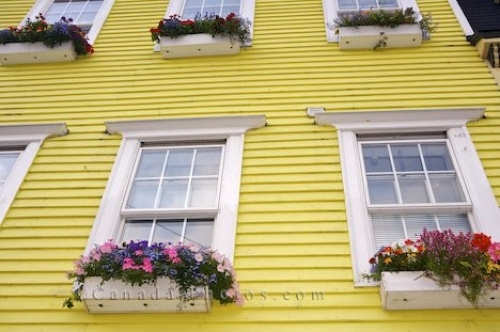 Picture of the potted plants blossoming in the planters outside each window on the houses in St. John's, Newfoundland. ... John's. When the potted plants are blossoming, Jelly Bean Row seems to have the added color which makes this tourist attraction even more unique. Potted plants on the exterior of the charming houses in downtown St John's, St John's Harbour, St John's Bay, Avalon Peninsula, Newfoundland, Newfoundland Labrador, Canada.